It occurs to me that a “magisterium” one is urged to “check out” might have a rather ephemeral quality quite inconsistent with the concept of the Magisterium rightly understood. And now the ephemeral, which is to say fake, magisterium of Jorge Mario Bergoglio—the name he insisted must still appear on his passport—has expanded again. This time Bergoglio tells us what he thinks about capital punishment. And what he thinks is that the death penalty is per se immoral. So, as the press happily reported, Bergoglio decided he would “change Church teaching” to suit his view—just as he pronounced “authentic Magisterium” his view that certain public adulterers should be granted absolution and admitted to Holy Communion while continuing to engage in sexual relations outside of marriage. Consequently, the Church teaches, in the light of the Gospel, that “the death penalty is inadmissible because it is an attack on the inviolability and dignity of the person”,  and she works with determination for its abolition worldwide." Notice how the constant teaching of Magisterium on the moral legitimacy of the death penalty is deliberately concealed behind the vague phrase “long considered an appropriate response” to capital crimes, as if a Catholic teaching rooted in Revelation were some sort of passing popular sentiment. First of all, the Church did not lack an awareness of the relation between human dignity and crime before Bergoglio’s arrival from Buenos Aires. In fact, God Almighty seems to have been under the impression that human dignity actually requires capital punishment for the crime of murder: “Whoso sheddeth man’s blood, by man shall his blood be shed: For in the image of God made he man (Gen 9:6).” And God evidently had human dignity in mind when, in the 20th chapter of Leviticus, He dictated to Moses the death penalty for human sacrifice and other grave offenses against the divine and natural law. Then too there is Christ’s own affirmation to Pilate that he had authority from above to impose capital punishment, as well as the Good Thief’s recognition that his punishment was just—precisely a sign of the humility and repentance that saved his soul. But then, what God has revealed seems to have little impact on the thinking of Jorge Bergoglio. Check it out! Unlike Bergoglio, the Magisterium adheres to the will of God in defending capital punishment. Thus, for example, the Catechism of the Council of Trent, echoing Genesis 9, declared: “The use of the civil sword, when wielded by the hand of justice, far from involving the crime of murder, is an act of paramount obedience to this commandment which prohibits murder.” Four centuries later, Ven. Pope Pius XII reaffirmed this invariant teaching: “Even when it is a question of someone condemned to death, the state does not dispose of an individual’s right to life. It is then the task of public authority to deprive the condemned man of the good of life, in expiation of his fault, after he has already deprived himself of the right to life by his crime.” (AAS, 1952, pp. 779 et. seq). As to the supposed “new understanding… of the significance of penal sanctions,” what is gratuitously asserted without the least explanation may be just as gratuitously rejected. We have no idea what this means, nor should we care. The contention that “more effective systems of detention” somehow render capital punishment immoral is about as firm a foundation for a purported “new” moral teaching as a slab of wet pound cake, and just as easily demolished. The mere civil capacity for detention of convicted killers does not eliminate just retribution and expiation as legitimate aims of penal law, as Pius XII makes clear in the teaching cited above. Moreover, what of the many places where “systems of detention” are inadequate to ensure public safety? Is the death penalty inadmissible even in such places, where murderers­— by paying bribes, for example—can rather easily escape and claim more victims? And what would Bergoglio have to say about prisoners who kill guards or inmates even in the most modern “systems of detention”? How has the State “ensured the due protection of citizens” when killers are able to kill again? What nonsense. The notion that modern “systems of detention” provide means of “redemption” more consistent with human dignity is laughable. The maximum-security prisons in which murderers, including serial killers, must be confined are generally sinkholes of violence and sexual depravity—literally hell on earth. 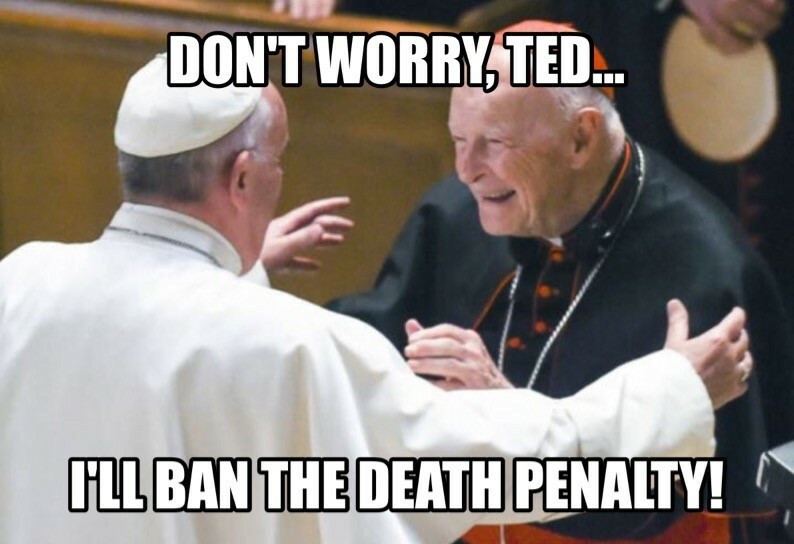 Meanwhile, the same Pope who calls for the worldwide abolition of capital punishment for the guilty has never called for the worldwide abolition of capital punishment for innocents in the womb, who are not afforded even the most minimal due process before their lives are snuffed out by the millions. Bergoglio remained silent even when mass murder of the unborn was about to be legalized in Ireland. That tells us all we need to know about Bergoglio and his fake magisterium. May God soon deliver the Church from the clutches of this man and send us the holy and courageous Pope who will consecrate Russia to the Immaculate Heart and make a beginning to the end of this insanity.